Omnimystery News asks Robert McClure: “If you could travel anywhere in the world, all expenses paid, to research the setting for a book, where would it be?” For those who have read Deadly Lullaby, how do you think McClure answered? To find out, click here and read the interview. Omnimystery News also elicits insights from McClure on his hobbies and interests, his take on reader feedback, and his current project, The Slow Dawn, the continuing saga of Babe and Leo Crucci. Omnimystery News provides noteworthy news, information, and reviews of mystery, suspense, and thriller books, television, movies, and games, and spotlights authors through interviews and guest posts. You can follow Omnimystery News on Twitter @mysteries and on Facebook. 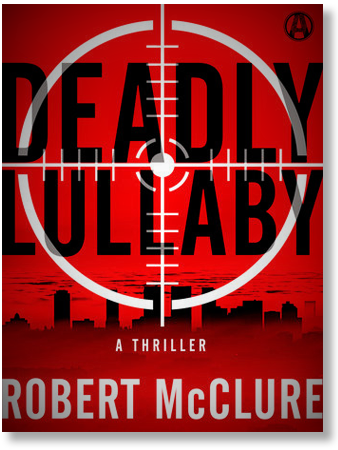 Visit Robert McClure’s website to Order, read 5-star Reviews and his Bio, as well as to keep up with other news about McClure’s writing including his debut crime fiction/mystery novel, Deadly Lullaby (click here). You also can stay in touch with McClure on Twitter @robertdmcclure (click here) or on Facebook (click here). ← Download DEADLY LULLABY without a Kindle or Nook device!